Tonight we’re celebrating the 18th edition of Le French Festival (LFF) 2019 presented by G.H. 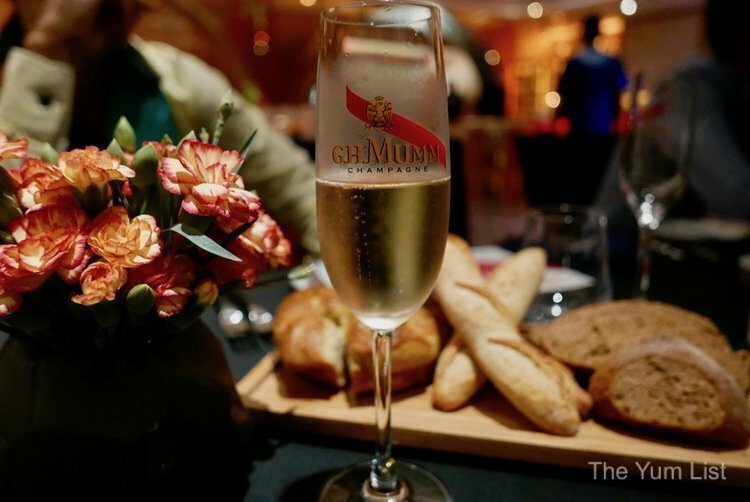 Mumm at Sofitel Kuala Lumpur Damansara. Happening from April 4th until May 12th, 2019, LFF fills the month with French films and gastronomic events. It’s the latter that we join tonight along with a crew of international and local bon vivants. 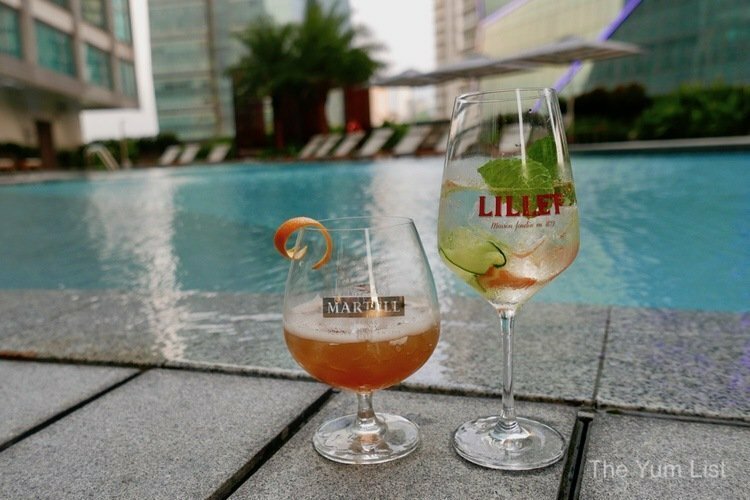 We start the evening with a cocktail by the pool and look forward to pairings by the houses of Champagne G.H. Mumm and Perrier-Jouët, as well as Martell Cognac. Cognac, Martell VSOP, provides the base for the cocktail. This balanced spirit is attractive with concentrated dried fruit aromas and the time spent ageing in French oak is well noted. Delicate in tannins, this cognac stays in the mouth for some time slowly departing with a warmth and a hint of spice. As well as being drinkable all on its own, it also makes a good base for cocktails and if you’d like to try your hand at mixing your own you can find a whole bunch of recipes here. 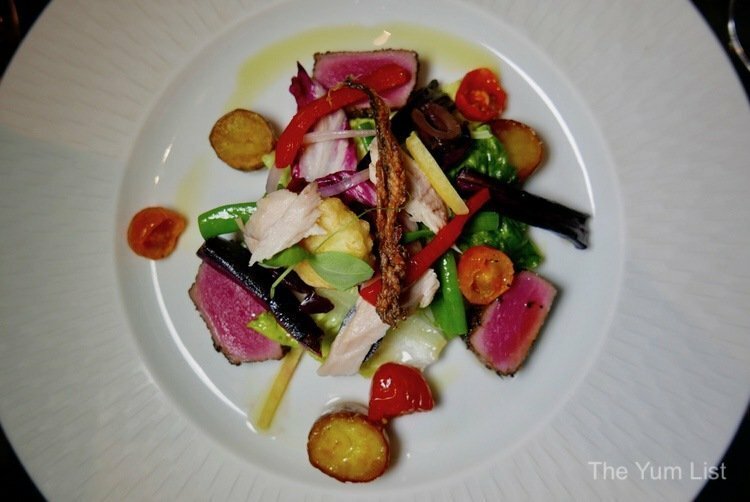 A classic, salade niçoise, launches the meal with tuna along with fine green beans, egg, baby potatoes and salted anchovies tossed together with baby cos lettuce and shallots. It might be a classic but this recipe is lushed up considerably with tuna ventresca (the belly cut) and a breaded quail’s egg. It is possibly the prettiest rendition I’ve seen too. 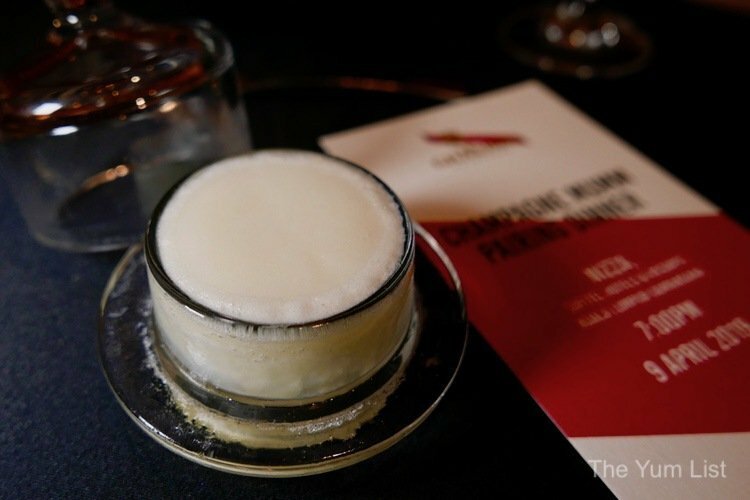 The pairing, Mumm Cordon Rouge, is a pretty special drop blending 77 crus into one cuvée. Pinot Noir, Chardonnay and Pinot Meunier give the Champagne structure, finesse, acidity and harmony. 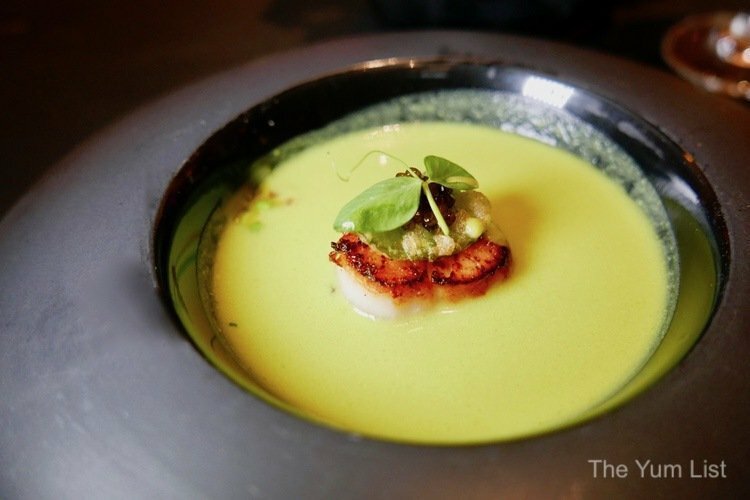 Cream of green peas, velouté de pois verts, continues to show how a simple recipe can be elevated immensely. This time it’s with the addition of scallops and caviar. It’s absolutely delicious, packed with the strong flavours of spring. 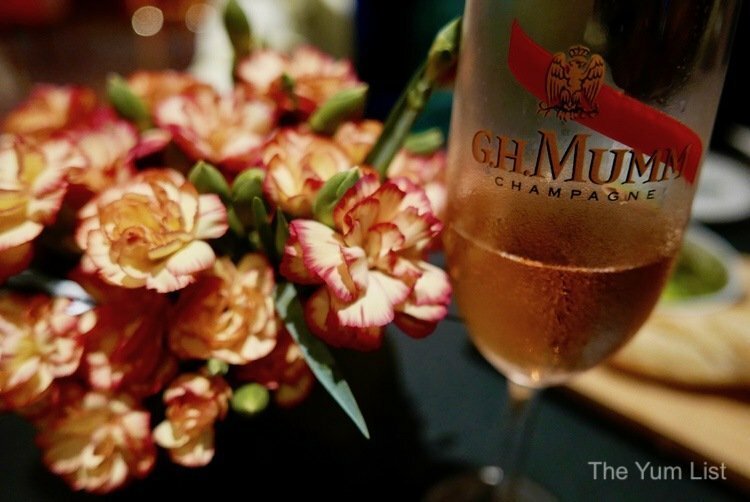 The wine for this course, Mumm, Le Rosé offers a further level of structure and intensity. It’s lively and refreshing with aromas of summer fruits rounding out to a fine savoury finish. Calamansi sorbet is bright and sharp, offering a thorough cleansing of the palate in just the right amount. Our meal continues with an upgrading of tradition. This time with an elegant rendition of sole meunière. 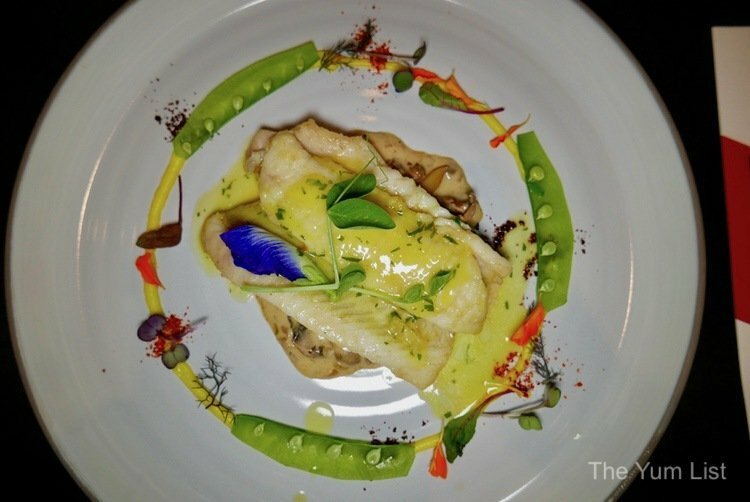 Sole fish fillet is coated in flour and pan-fried in butter. It’s accompanied by sautéed wild mushrooms and garlic and parsley cream and plated ever so stylishly. 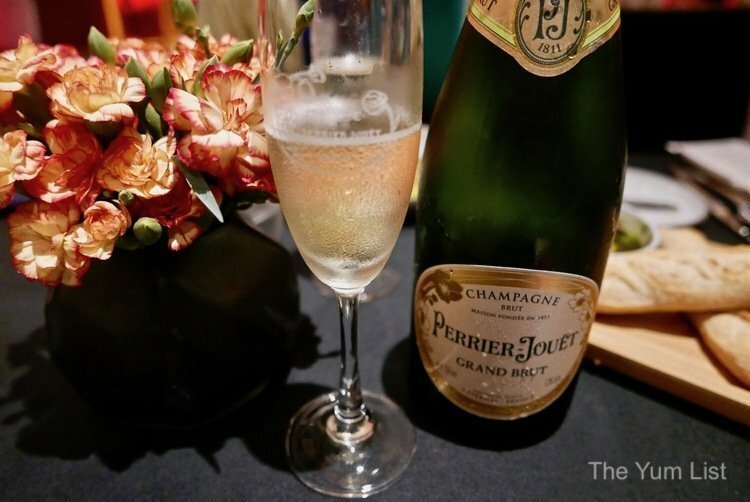 The Perrier-Jouët Grand Brut NV wine mate is at once vibrant and full of life. Fruits and flowers gift a bouquet reminding me of spring days spent in the garden and it soon becomes obvious why the floral label is so appropriate. It’s a beautifully balanced wine bringing layers of honey, peach, vanilla and butter to a persistent finish. In this meal, we skip the traditional French cheese plate and conclude directly with dessert. 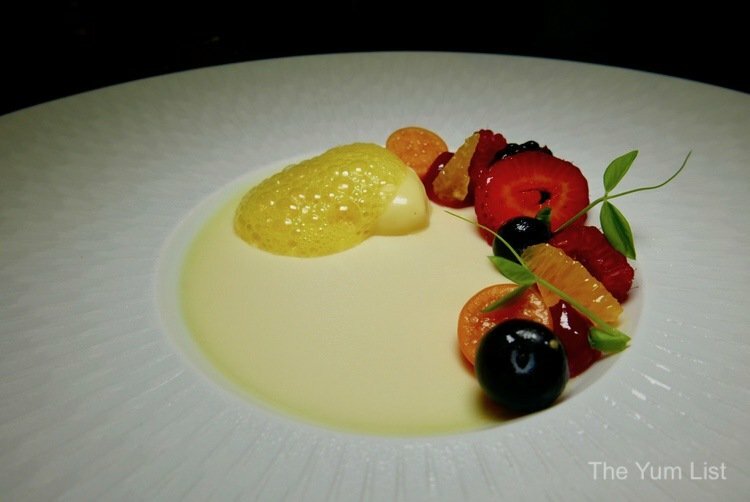 A velvety smooth pannacotta is lightened with fresh fruit and a passion fruit foam. 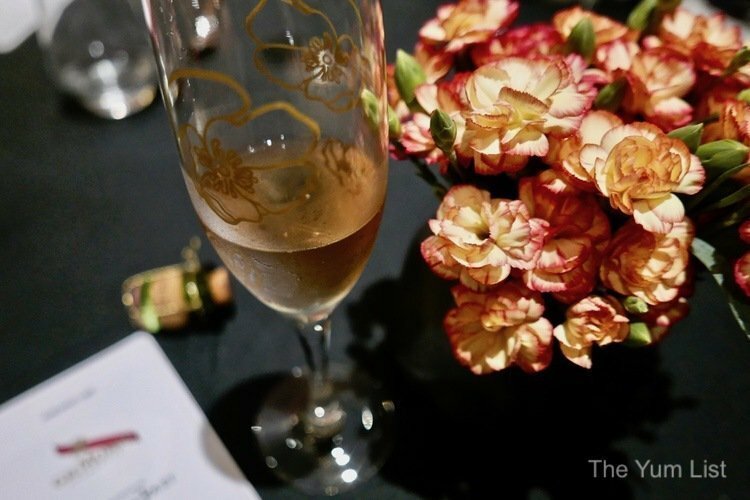 I do love bubbles, especially pink ones, and I could end the meal happily right here with the Perrier-Jouët Blason Rosé. The nose is bright and bursting with berries. Layers of citrus, honey and a whisper of spice take the complex aromas through to a similar palate and a lingering crisp ending. There is one last treat though, and to this, I can’t say no. 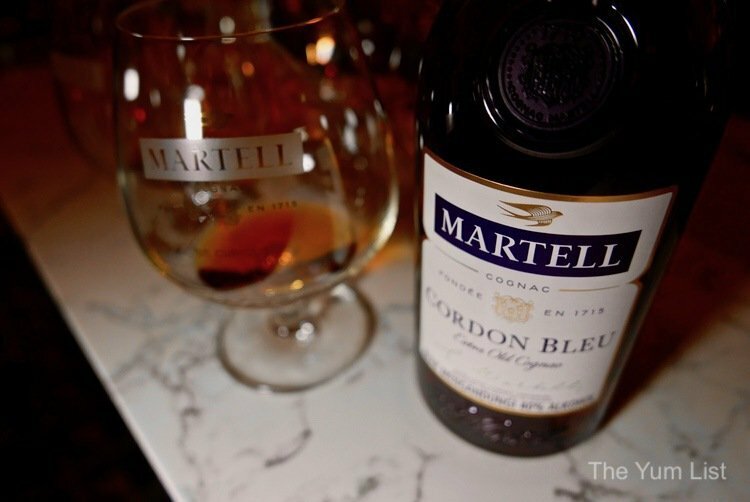 The eaux-de-vie is in Martell Cordon Bleu is aged for between 10 and 25 years. There’s a familiarity here reminding me of the introductory VSOP but this sip is much more complex. First conceived over 100 years ago in 1912, there clearly is a reason it has been in production for such time. There are fruit and spice and a conclusion that stays with me for some time. It is a beautiful drink. 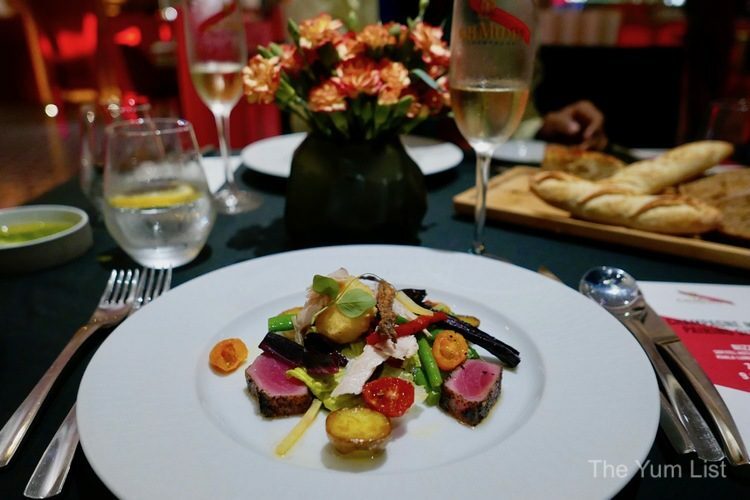 If you’re keen to enjoy more fine French food, beverage and the arts check out the program for Le French Festival 2019, Kuala Lumpur here. Follow Sofitel Kuala Lumpur Damansara’s Facebook page to stay informed of more delicious events. Wine lovers can also discover some of the fabulous vintages available in Kuala Lumpur here. Wow! I was wondering with the green pea soup was yellow in colour. I’d love that! Pannacotta! Yum yummm!!! All the plating are so delicate and classy. I could imagine how the taste linger in my mouth from that calamansi sorbet. Pannacotta was so beautifully presented. Tempting dessert.